My father immigrated to Australia in the early 1960’s, when he was fourteen. He travelled on a ship with his parents and three brothers. They were what people called 'Ten-Pound Poms' . This was an assisted passage scheme established and operated by the Australian government. The purpose of the scheme was to increase the population of Australia and provide workers for industry. My grandparents are no longer living. They were very patriotic to their homeland and very keen to instil English culture in their children and grandchildren. They loved everything that I imagine is quintessentially English: strong tea, fish and chips, roast beef with Yorkshire puddings, HP sauce, antiques (made in England, naturally) and the very Victorian pastime of getting out into the countryside. My Nanna taught me many great things. She was independent and strong. She even drove a motorbike when she lived in the UK. She worked as nurse in hospitals in England and Australia. She loved her job and was a very hard worker, who could knit, watch TV, talk and chain-smoke all at the same time. She couldn’t cook, and insisted that my Pa do all the cooking. She taught me to look at the bottom of ceramics and the writing on cutlery to see if they were any good, if they were made in the UK they were worthy. She was different to my other Australian born grandmother, who lived on a farm and cooked two hot meals a day. My grandparents lived in a ridiculous amount of houses in Australia. I think this was just because they could. In England, even though they were very hard working, buying houses would have been difficult, especially one to serve a family of six. The first house that they bought was in Chewton, near Castlemaine. This was a very modest house, out of town, which allowed them to indulge their children with horses. I imagine that keeping horses in England would have been very expensive, which I think is another thing they did just because they could. 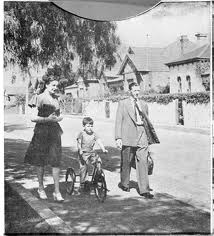 They owned many homes in Castlemaine and were able to provide their children with amble space and freedom. 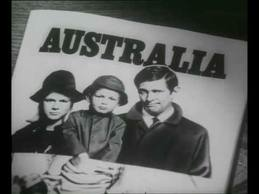 My father has told me that settling into Australia was very difficult. 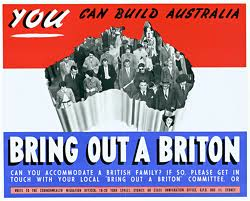 The Australians were not very accommodating to the emigrants. When I was young I asked my Dad why he didn’t have an English accent like his parents and he told me that it was beaten out of him in school. Assimilating was crucial, for survival. I will be thinking about my grandparents on this trip a great deal. I will be wondering how difficult it would have been to have four very young boys in a tiny cramped house, with no yard. How hard it would have been to decide to emigrate and say goodbye to family and friends and the difficulties they must have had adjusting to a different culture. I will also be looking for and hopefully finding things that will trigger fond memories of my shared past with them.